applesauce and salad with goat cheese. ﻿﻿We are at the halfway point of Chanukah and I thought some of you out there might need some fresh ideas on how to serve the traditional potato pancakes. So, check out my ideas to light up latkes for the remaining nights of the holiday and as a special present at the end, my favorite pot roast recipe to go with them. Don't save this Zippy Cranberry Pot Roast just for Chanukah (or Hanukkah) it's great for any meal and the leftovers are wonderful. So here are eight ways to enjoy your potato pancakes. (Need a recipe for latkes, check out shortcut latkes here and my traditional recipe here. 1. With spiced applesauce. Warm homemade unsweetened, chunky applesauce and for each 2 cups of sauce, add 1 tsp. cinnamon, ½ tsp. allspice and a pinch of ground cloves. Add brown sugar to taste if desired. Simmer until spices have blended. Taste and add more of the spices if you want a stronger flavor. Serve warm atop latkes with sour cream or yogurt. 2. With a side of red cabbage and apples. Peel, core and thinly slice a large tart, firm apple. Sauté in butter or oil until softened. Drain a jar of purchased pickled red cabbage and toss with the apples. Heat through. Taste. Add a tsp. of sugar and or a Tbs. of apple cider vinegar if needed to make sweet and sour to your liking. Taste again and adjust as needed. 3. Sprinkled with sugar. 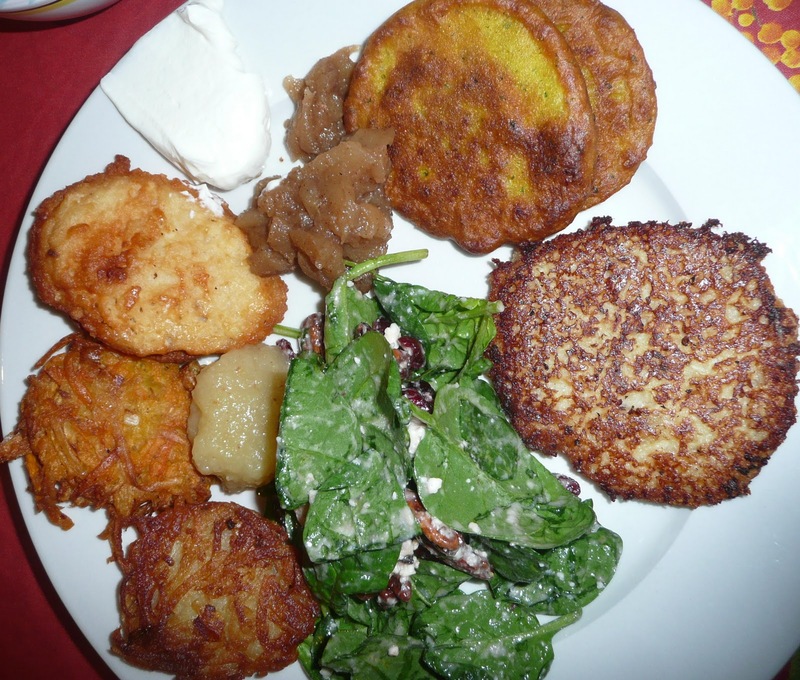 While I had not heard about this tradition until recently, I researched it and for many people it wouldn’t be Chanukah without sugar on their potato pancakes. 4. With an egg on top. A recent acquaintance told me how delicious a freshly poached or fried egg is served on top of a crispy latke. Nice for breakfast or a light entrée. Top with a sprinkle of chopped green onions or chives, a pinch of sea salt and some freshly ground black pepper. Serve on a bed of frisee lettuce for a really gourmet brunch. 6. Bite size as a base for appetizer toppings ranging from bits of smoked salmon or a pinch salmon roe atop a dab of sour cream to hummus topped with chopped green olives or bits of preserved lemon (available in jars at some markets). 7. As a foil for a spicy sauce. Try squirting a little Sriracha chili paste sauce or other hot sauce on your latke, serving with some fresh salsa or eating with a sweet and spicy fruit sauce such as this one from “Cooking Jewish” by Judy Bart Kancigor (Workman). Combine in a medium sauce pan 1-16 oz. can pitted black cherries (slice first) plus the liquid from the can, ¾ cup of raisins, 1 cup white wine, 2-24 oz. bottles of Heinz or other chili sauce and 1/3 cup of dark brown sugar. Cook over medium-high heat, stirring occasionally until reduced down and thick, about 20 minutes. 8. As a side dish to my favorite pot roast recipe with cranberries. Adapted from “The Jewish Holiday Cookbook” by Gloria Kaufer Greene (Times Books). I wish I could take credit for this recipe. It’s easy and delicious and is a perfect partner to crispy fried potato latkes. I’ve made it with all sorts of cuts of meat, prepared it in the pressure cooker, and even cooked it ahead, frozen the sliced meat in the sauce and reheated it and this recipe has never failed to be anything but wonderful. The rich meat, spicy horseradish and tangy cranberries all really complement the latkes. This pot roast is also good over egg noodles. Be sure you keep cooking the meat until it gets really tender. My family likes when it is falling-apart soft. Combine tomato sauce, cranberry sauce, horseradish, mustard, vinegar, wine or juice and oil in a large Dutch oven or other pot. Bring the sauce to a boil over high heat. Lower heat until just simmering and cook for 5 minutes. Trim all excess fat from the roast and add to pot. Turn in sauce to cover. Cover pot and simmer over low heat, basting meat and turning occasionally. Cook for 2 to 4 hours or until the meat is very tender and no longer chewy. Remove meat from sauce. Leave pot uncovered and raise heat to medium high and cook down the sauce, stirring occasionally until it is as thick as you’d like. Cut meat into thick slices across the grain. Spoon some of the sauce over the meat on the serving platter and put the rest in a bowl to serve alongside. How do you like to serve your latkes? Please leave your ideas and any links in the comments section. Thanks! About the photo: Latkes, latkes everywhere at a recent latke tasting party. A version of this article appeared previously in the Temple Beth Abraham Omer. I love Latkes with some sour cream and salmon roe, for me, this is a little piece of heaven! Nice. I love the idea of the egg. I wish I could say the egg was my idea, it's not, but I did have the idea of putting the egg+latke on the frisee. I'm dying for this recipe. You've been doing great lately. Thanks for sharing! Love latkes for breakfast! I like it with gravy though. It's toothsome I swear. But I also like the applesauce idea. Lol.